And the people that’ll set that valley free. We’ll set this valley before we’re through. 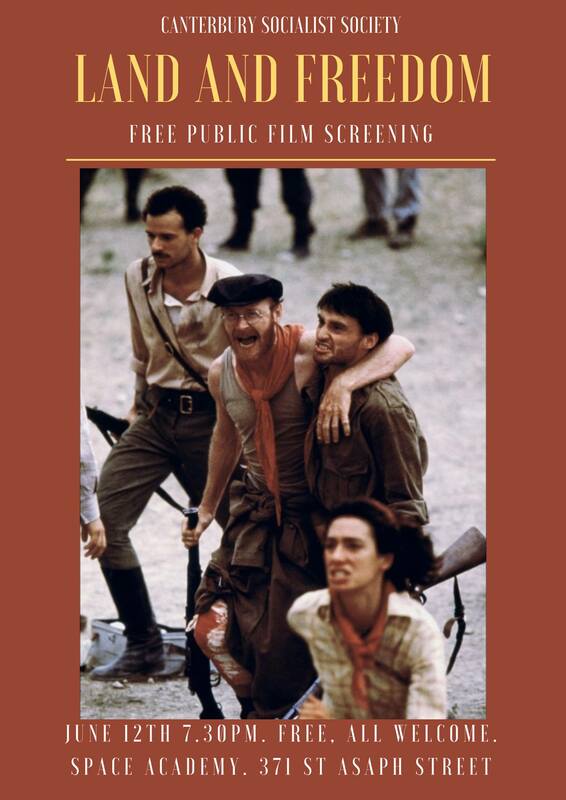 For our June 2019 event we will be screening Ken Loach’s 1995 film “Land and Freedom” which follows a young unemployed member of the Communist Party of Great Britain and his decision to join the Republican side during the Spanish Civil War (1936-39). Considered a precursor to the Second World War, the Spanish Civil War was the first attempt to defeat fascism as it began to take root in Europe in the 20th century. The West took a “non-intervention” position, and volunteering to go to Spain was illegal. Regardless, tens of thousands of volunteers did go and fought with the International Brigades in Spain. Republican partisans included: George Orwell, Ernest Hemingway, Pablo Picasso, and Tristan Tzara. Less famously David Guest (the son of an English MP), and Lewis Clive (Olympic Rower) also fought and were both killed in the Battle of the Ebro in 1938. Many who fought in Spain were initially barred from serving in the Second World War due to official hostility to Socialism. All welcome, free to attend.